Angelina Jolie took Shiloh, Zahara and Pax to aquarium on November 30 in Paris, France. Angelina Jolie was smiling while directing “United Love Story” in Budapest, Hungary on November 13. 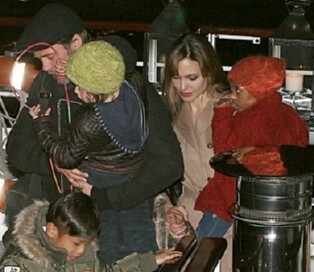 Brad Pitt and Angelina Jolie took the kids to a local park in Budapest, Hungary on November 5. Angelina Jolie was spotted with Shiloh and Zahara as they are heading for outbound flight in Budapest, Hungary on September 18. Angelina Jolie’s daughter will only wear her older brother’s cast-offs.